Housing Minister responds to Netanyahu's comments that not all communities in Judea and Samaria will be part of Israel in a peace agreement. 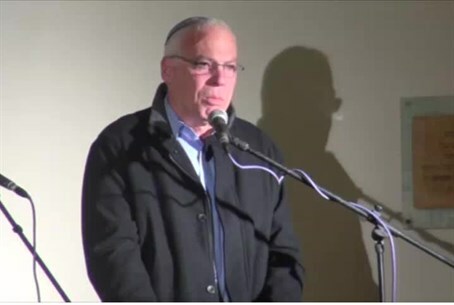 Housing Minister Uri Ariel (Jewish Home) declared on Sunday that no communities in Judea and Samaria will be evicted. The remarks come on the heels of comments by Prime Minister Binyamin Netanyahu, who declared in an interview on Friday that not all the communities in Judea and Samaria will be part of Israel in a peace agreement, but that he will do his utmost to ensure that as many as possible do remain under Israeli control. Minister Ariel stressed that Israeli citizens will live only under full Israeli sovereignty and added, “West of the Jordan to the sea there will be only one state and that is the State of Israel." Speaking at the same memorial service, Economy Minister Naftali Bennett also declared that despite what Netanyahu said, all Jewish towns in Judea and Samaria would remain under Israeli sovereignty.